Earth Cache at a very well known cavern in Alabama. You have to ask for Carrie or Rebecca and have them take you to the entrance of the Cavern which is only about 40 feet away from posted coordinates. Tell them you are geocaching. The rest is up to you. The property that includes Sequoyah Caverns was obtained by Abner Ellis through the provisions of the Homestead Act of 1862. Ellis began homesteading proceedings in the 1800's and obtained the land patent to the cave property in 1890. In exploring and developing the property, Ellis and his bride, Harriet Serena Hawkins, discovered the Caverns and became interested in them. During his exploration of the Caverns, he found salt troughs, cooking pottery and other artifacts in the large entrance room. Because of this, and the smoke blackened walls and ceiling, he named it the Cherokee Cooking room. Ellis was extremely interested in the youth of his day and on weekends they would congregate at his home, located almost at the mouth of the cave, and would explore the Caverns with him. During this period and through the ensuing years, the artifacts were carried away by these young explorers and those that followed them. It is a known fact that both the Cherokees and Creeks lived in the cave. Names, initials and dates going back to 1824 have been found on the cave walls and formations. Old timers in the area say they have been there as long as they can remember. On one large column, now named the Sam Houston Column, is inscribed "Sam Houston, 1830". This is believed to be authentic, and could well be, as Sam Houston lived with the Cherokee Indians for some years and the story has been passed down that he married one of Sequoyah’s daughters. Early white settlers held square dances and old time "singings" in the Caverns for many years and explored them by torchlight. A cave or cavern is a natural underground void large enough for a human to enter. Some people suggest that the term 'cave' should only apply to cavities that have some part which does not receive daylight; however, in popular usage, the term includes smaller spaces like sea caves, rock shelters and grottos. Millions of years ago the beautiful state of Alabma was covered by a shallow sea. Deposits of tiny marine animals and plants on the sea floor formed thick layers of limestone. When exposed to weather, these layers of limestone became the world's best "cave forming" rock. 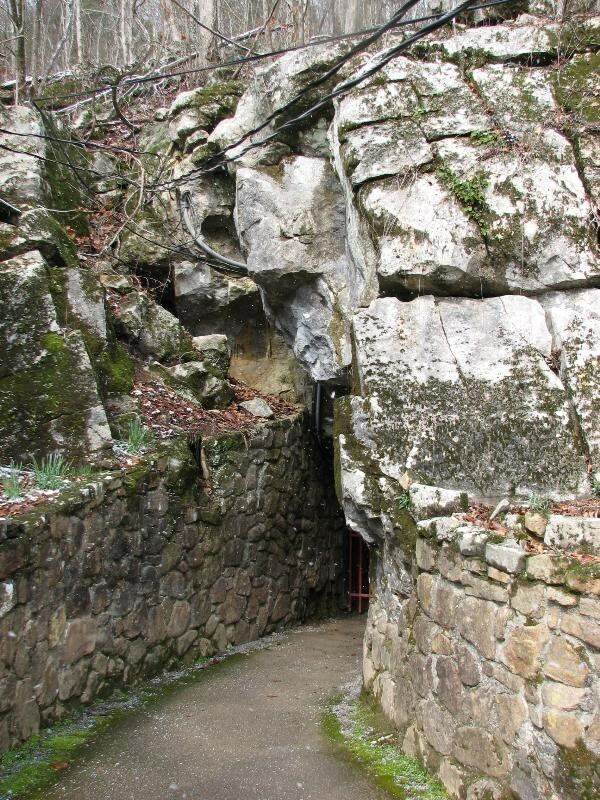 Rainwater, mixed with carbon dioxide in the air and soil, formed a mild acid which slowly worked its way into cracks in the limestone and began to dissolve passages. Most people don't realize that caverns are important ecosystems which harbor a variety of rare and endangered species. Cavern systems also contain significant archeological artifacts, fragile mineral formations, and easily contaminated water supplies. Caves in Alabama are susceptible to vandalism, looting by artifact hunters, and just plain carelessness when exploring. The water and animal life in Alabama's caves can easily be impacted by sewage, illegal dumping in sinkholes, uncontrolled soil erosion, chemical spills, and agricultural run off. To get credit for this Earth Cache, ask the nice ladies, either Carrie or Rebecca to take you to the cave entrance. Tell them you are geocaching. They will take you to the entrance of the cave but not inside. Post a picture of yourself with GPS and the cavern entrance in the background and answer the following questions. 1. How wide is the entrance to the cave? 2. How many bat figures are on the gate to the cave? This earth cache is available only during March - October & December 21 - January 1 - Monday-Saturday 0830am-500pm (Sunday - closed). Please respect the owners property. Exclusive permission has been granted for placement of this Earth Cache by the owner, Mr Jones. A special thank you to him for allowing earth caching on his property.